Sportspeople can be a superstitious bunch, following certain processes in the hope of bringing even the slightest bit of good fortune. Referees are no different. PRO’s Jose Carlos Rivero is one of those. If you’ve been to or watched a game involving Rivero, you may have noticed his pre-match ritual. When taking to the field to officiate, he will always kiss the ball. But there’s more to it than that, and it goes back to when he was coming up through the ranks. “Every time I kiss the ball I thank God for this beautiful sport that gives us passion and an extraordinary feeling,” he told proreferees.com. “I’m blessed to be a part of soccer and I give thanks for that. “It all started when I was a State Referee [grade 6] back in 2007 and I got to be fourth official for Alex Prus in Ecuador Nat versus Colombia Nat in the Old Giants Stadium. “That day was my first taste of a professional game. The wait in the tunnel and then the walk out onto the field listening the FIFA anthem with the stadium full, was a memorable experience. 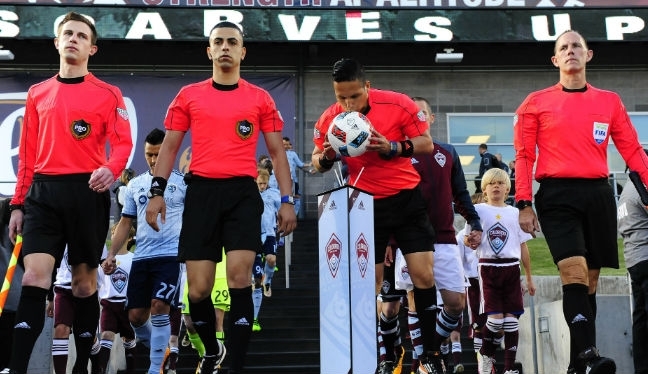 Rivero made his Major League Soccer debut in 2012 but has been in and around locker rooms and stadiums since the age of three. His grandfather was a FIFA referee, as well as his uncle, while his father was destined to become an international official before he was involved a car accident. It was that incident that mapped out Rivero’s career path, and his ball kissing is inspired by his family. “I copy the ball-kissing ritual from my dad. Since I was a kid, I noticed my dad and my uncle doing it, and they also told me that my grandfather did it, too.